ALIENS are harvesting energy from the Sun, it has been claimed after two images emerged showing inexplicable monster objects circling our star. In a promotional blurb for the video the question was posed: “The fact that the UFO is a different color and shape to the rest of the connected line is what convinced me to upload this. UFO blogger Scott C Waring picked up on the video. The ‘UFO’ seen by Streetcap1 which may be draining the sun. He said: “This UFO shot out of the sun yesterday but was seen by Streetcap1 of Youtube. “The UFO may have been using the suns energy to fuel itself or to recharge in some way, but it’s leaving at high speed. 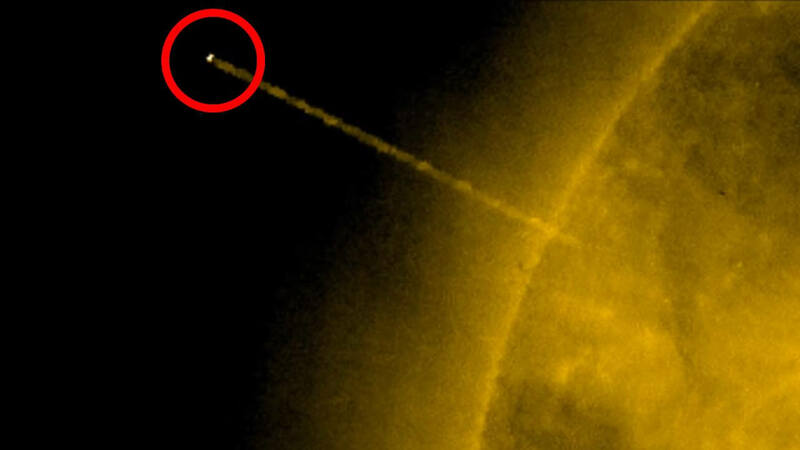 Later, Mr Waring posted his own Nasa image, taken by the Solar and Heliospheric Observatory (SOHO), a spacecraft with telescopic camera sent to image the sun and beam back high detail images, of what he described as huge UFOs orbiting the sun. In a blog on his website ufosightingsdaily.com, entitled ‘Hundreds of Giant UFOs Orbiting Our Sun, NASA/SOHO Images Confirm’, he suggested the UFOs were as big as Earth in some cases. He wrote: “While looking over some SOHO images I decided to enlarge some of the UFOs in the photo. NASA*UFOSD ‘UFOs’ seen by Scott C Waring in NASA SOHO images of the sun. “Now please know, the UFOs in each photo are different because the sun is rotating, and there are a lot of moon size and earth size UFOs around our sun. “Back about 10 years ago, two Russian scientists announced that they have found hundreds of UFOs orbiting Earth’s sun at any given moment in time. “And that these UFOs can increase and decrease speeds for no reason, and that they can make sudden right turns at speeds that should be impossible, especially for a moon size UFO. “Now, are these unmanned giant drones sent to get energy for planets far away? While Mr Waring may be taking giant leaps from the anomalies in the image to his theory, it is one which is widely shared by some UFO and alien conspiracy theorists. Meanwhile, sceptics claim because the telescope is at such a massive zoom, they are just out-of-focus anomalies appearing to give such shapes in the final image. Sceptics claim the objects around the sun seen in these pictures are just coronal mass ejections from the sun – which are an unusually large release of plasma and magnetic field from the solar corona, which often follow solar flares.